I spent this weekend visiting with house guests, baking bread (a buttermilk honey recipe to be shared this coming week…I’m obsessed with it, and I warrant you will be too), combing the flea market (hello 66 piece set of mid-century flatware for under $100! ), and doing the nesting I love so well (which generally involves the moving of a plant ever so to the left, to the right, and squinting one eye.) And then yesterday I received all kinds of good news, both so good I could hardly believe it. 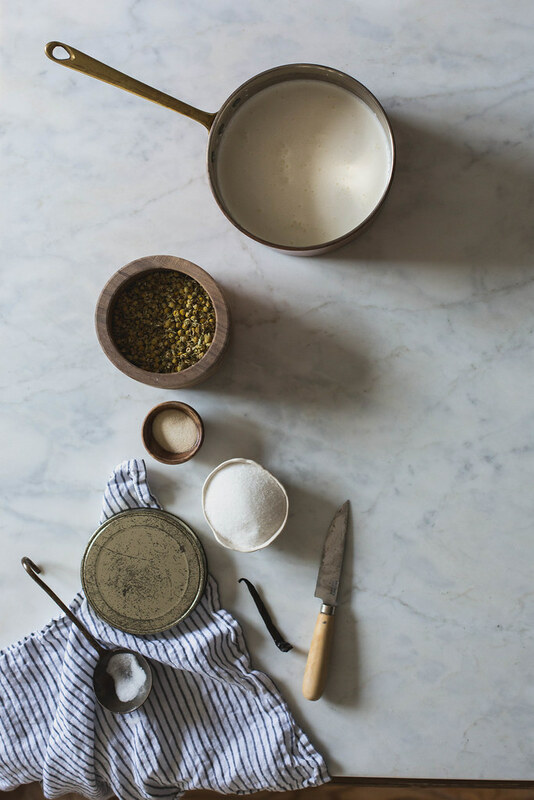 Local Milk was nominated for a Saveur Best Food Blog Award in the photography category! Voting is open until April 9th, and you can vote for me here. Thank you all for your support! On top of that I learned that I’m going to an aunt to a baby girl! So in celebration of all these things and the spring, the sprang, and the sprung I’ve got a recipe for my ideal vernal dessert: a chamomile panna cotta garnished with lemon & poppy olive oil shortbread crumbs as well as photos of the parade of foraged florals that have been my constant companion since they started blooming. Spring is being coy. I never did have an appetite for coy; I like my seasons as I like everything, all out on the table. I don’t have time for a tease. 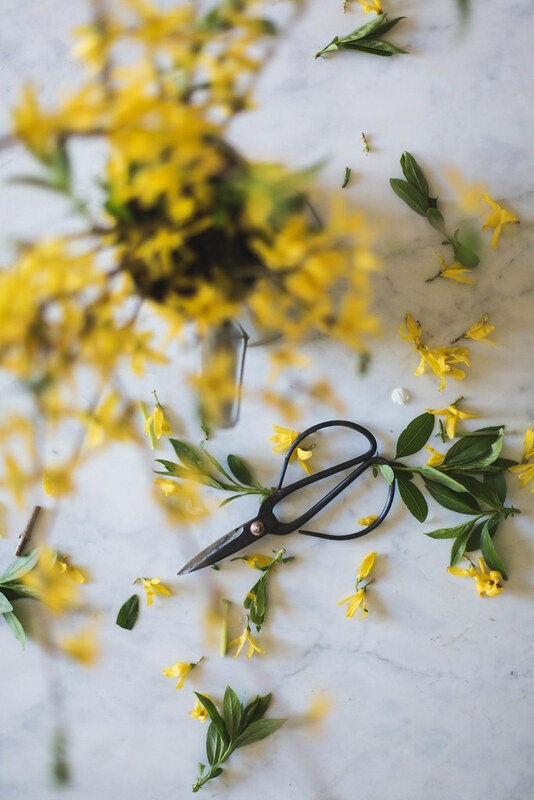 But the trees keep budding despite the obstinate chill, and the shears I carry around in my purse have been getting plenty of action. 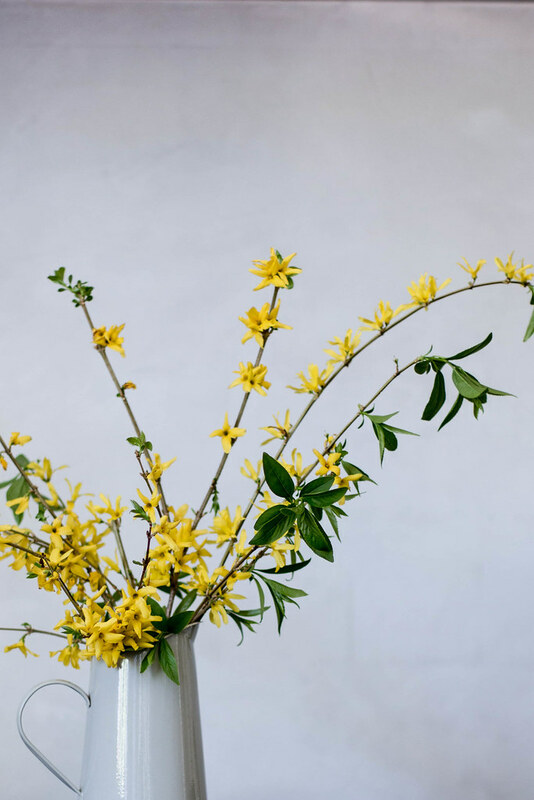 A spray of forsythia here, a shivering cherry tree there. My porch is no longer barren; instead herbs have taken up residence in my motley crew of pots, and everything has been swept finally clean. My birkenstocks have already made one appearance, and today it’s truly warm. Warm by my reptilian standards; I have cold blood it would seem. Animation is creeping in, and it’s contagious. The produce! 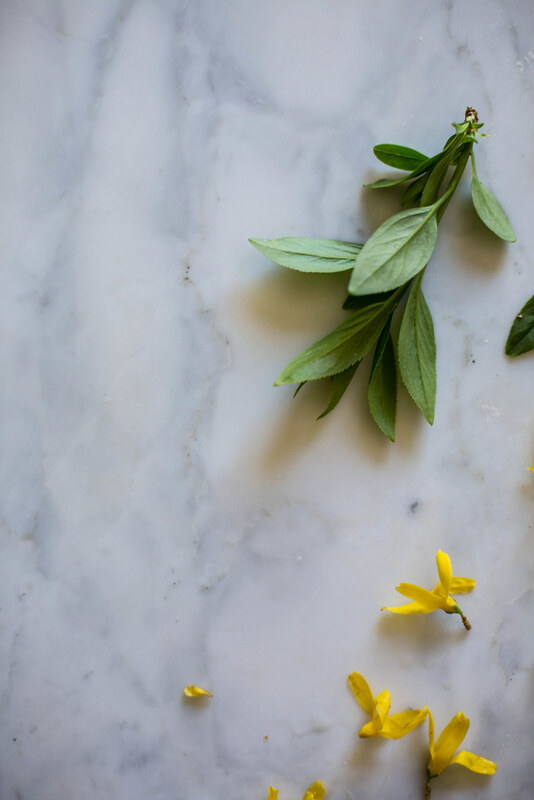 I look forward to weeks of berries, nettles, and garlic scapes—some of my favorite spoils of spring. As a lot of you know, we just completed a kitchen renovation. Here are a few little peeks, the final reveal will come, but I’m a little bent on getting everything *just so*. The wildly talented team Tara & Percy of the Jersey Ice Cream Co. made my dream kitchen a reality, and I don’t think I have the words for how grateful I am for their hard work & vision. Aesthetically, we had perfect synergy. And that’s a helluva unicorn for me to find. As for the range—that range. It feels like a dream to have a freakishly amazing Lacanche in my humble little Tennessee kitchen. I’m intimidated by it. I’m in love with it. I now swear by the gas oven. And it will be the cornerstone of my work for countless years to come. It will, no doubt, be making many a cameo on this space. My life revolves around this one room, even when I’m on the road or shooting at another location, this is where I center. I cooked my very first dinner in the new space this past weekend; I was finally home. I’ll be posting the full party in a couple of days, but let’s have dessert first. 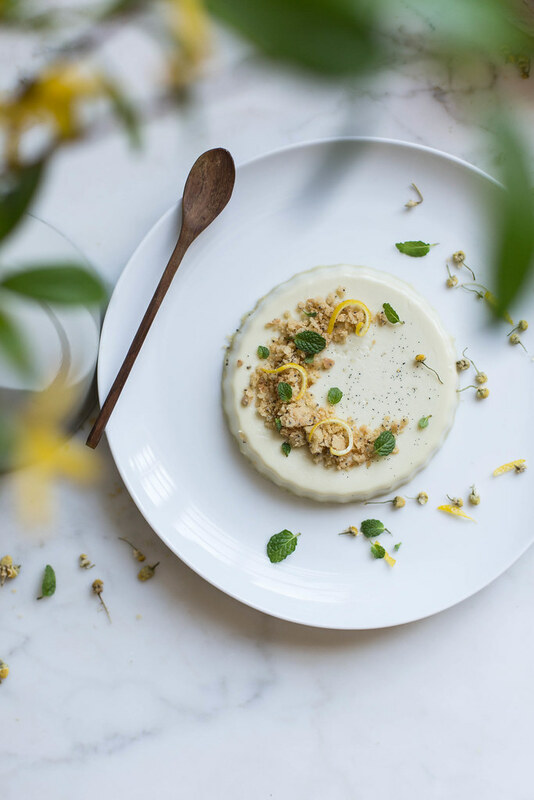 This panna cotta, inspired by my nightly cups of herbal tea—potent sleep elixers full of hops, chamomile, mugwort, and damiana, is perfectly subtle. I didn’t want much to compete with the chamomile flavor-wise, so I opted for a vanilla bean and nothing more. Vanilla has a way of turning up flavors; it enhances without overpowering. 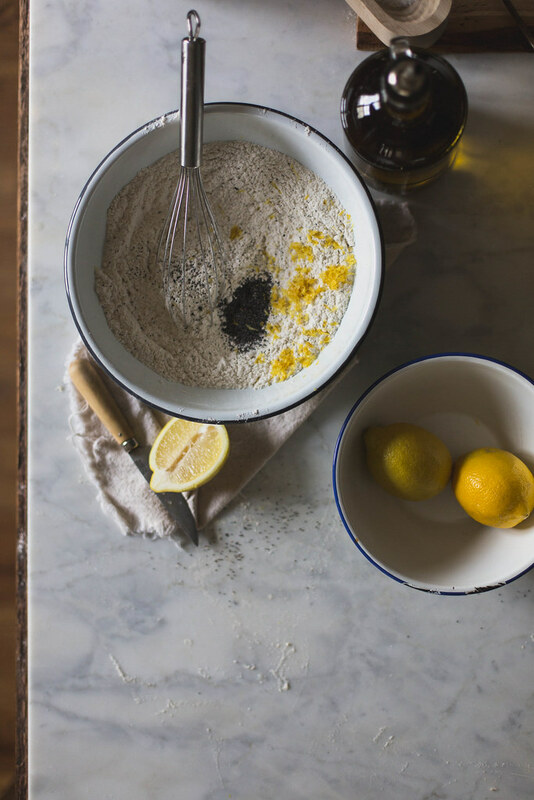 I knew I wanted to make an olive oil shortbread with a citrus component, and I ended up adapting this recipe by Cookie + Kate. It turned out to be perfect for this application here, a crescent of crumbs that mingle with the cream like a crust. I also served bars of it alongside the panna cotta, because: moar cookies. The salt in the shortbread really rounds the whole thing out, as do a few tiny mint leaves. Suffice to say, I think I’ll be making a lot more panna cotta. It’s painfully easy, but the result is something altogether luxurious and sublime—silky and light. I use the recipe from the New York Times as my base; I think the ratio of cream to gelatin in it is perfect. Other ratios I’ve tried have resulted in a panna cotta that’s too firm for my taste. I like it to be set but very creamy, as it should be. You can substitute half and half for half the cream in the recipe. But why? Okay, I get why. But the flavor and texture of pure cream is, in this cook’s opinion, untouchable. And a tip on unmolding: set the dish in a bowl of very hot water for about 30 seconds to a minute and then proceed to gently invert onto a plate. Or just eat them straight out of the dish! 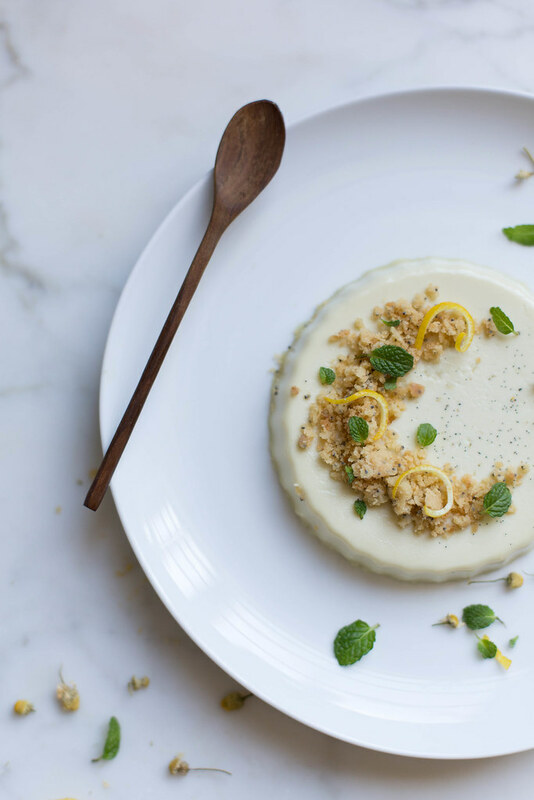 This creamy panna cotta, perfumed with chamomile, is the perfect consistency and the ideal dessert to welcome spring. It's easy enough to make on a week night, can be made ahead, and, served with shortbread crumbs (recipe below) and a few fresh herbs, it's a special, dinner guest worthy dessert. Pour one cup of the cream into a medium sauce pan; sprinkle the gelatin over the surface and allow to sit for 5 minutes. Heat on low, stirring, until the gelatin has fully dissolved. Add in the rest of the cream, vanilla beans scraped from the pod, the pods themselves, chamomile flowers, and the sugar. Cook on medium heat until it's just about to boil, until one or two bubbles arise around the edges of the pot. Strain mixtures through a cheese cloth lines sieve into a bowl. Squeeze the remnants in the cheese cloth to get all of that good chamomile flavor! Ladle the mixture into custard cups or whatever dish you choose. Chill in the fridge for at least 3 hours. Once set, they can be covered and stored up to 24 hours. To unmold (if desired), run enough hot water in a shallow bowl or pan to come 3/4 the way up the sides of your panna cotta cups. Set the panna cotta in the hot water for about 30 seconds and proceed to gently invert onto a plate. Refresh the hot water as needed to continue unmolding the panna cotta. Garnish with crumbled shortbread & a little fresh mint. Candied lemon peel would be excellent too! (recipe below). Pat the dough out into a 9x9" baking pan, and bake for 40-45 minutes until the edges are golden and it's just set. I baked it on convection, see below for notes on that adjusted cooking time. panna cotta is my favorite. so is chamomile. so are you. congrats! Beautiful, Beth! Congratulations on the nomination… chamomile panna cotta sounds perfectly springy even if it’s still freezin’ outside. The snow may be waist-deep here right not, but you’ve given me visions of forsythia, and between that and the warm sunny day we had today, I’m all set and fortified for another month plus of snow. Thanks dawg. Congratulations on the nomination.. it’s so well deserved.. I love all of the flavors in this panna cotta. Definitely a recipe to try . This looks so delicious and poetic, I will definitively try it this weekend! I love your creations so much, it is so inspiring. Congratulations on all fronts. 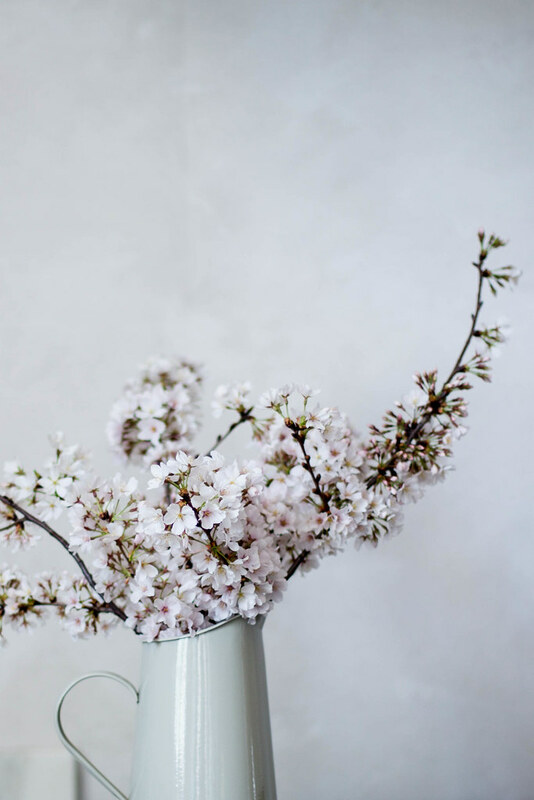 Love your blog – recipes, style, taste and your photography is such an inspiration. Gorgeous. Voted for you! Huge congrats to you!! So exciting and you deserve it! Congratulations!!!! On both learning you will be an Aunt and also the Saveur awards. You deserve to be nominated in that category, your photography is always stunning and such as source of inspiration. This panna cotta looks superb! Love the flavor combinations. This is one of my most favorite places on the Internet. I forget time and space when I read your posts; they consume me. 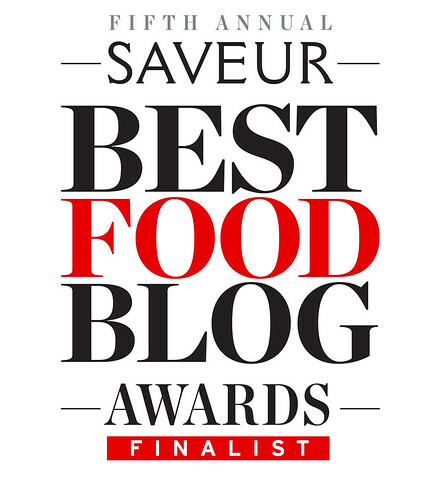 Your words are beautiful & honest, your recipes are thoughtful & delicate, and your photography, well, it’s worth a Saveur Best Food Blog Award. Once more: Congrats, Beth! Thank you for sharing your work with us all and being such an incredible inspiration. I would love to see you winning the award. PS am going to make this pannacotta for my husband this weekend – he LOVES pannacotta. 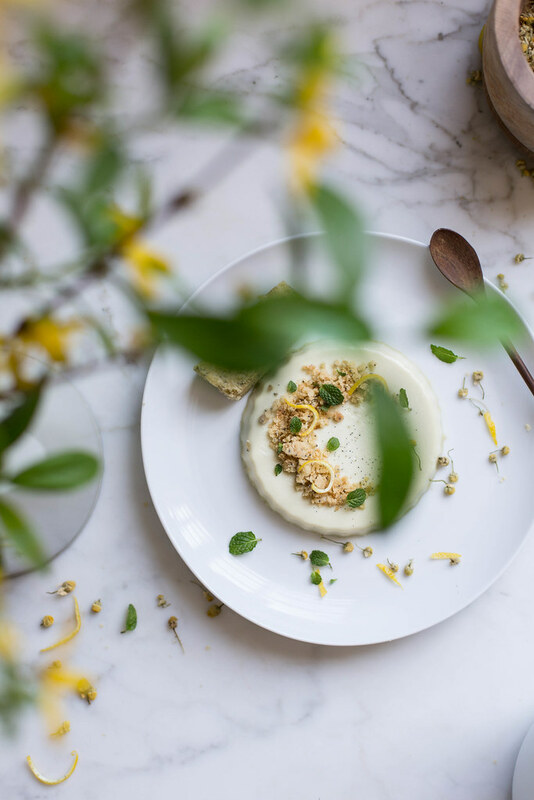 i’ve been reading your beautiful blog for quite a while now and this panna cotta recipe really is my favourite so far 🙂 i can’t wait to try it! thanks for sharing! Congratulations on the nomination (and the exciting aunt-news!). It’s so well deserved Beth; your site is always an inspiration. Amazing recipe and beautiful kitchen! Congrats on the nomination, your blog its one of my favorites so i’ll be voting for you! 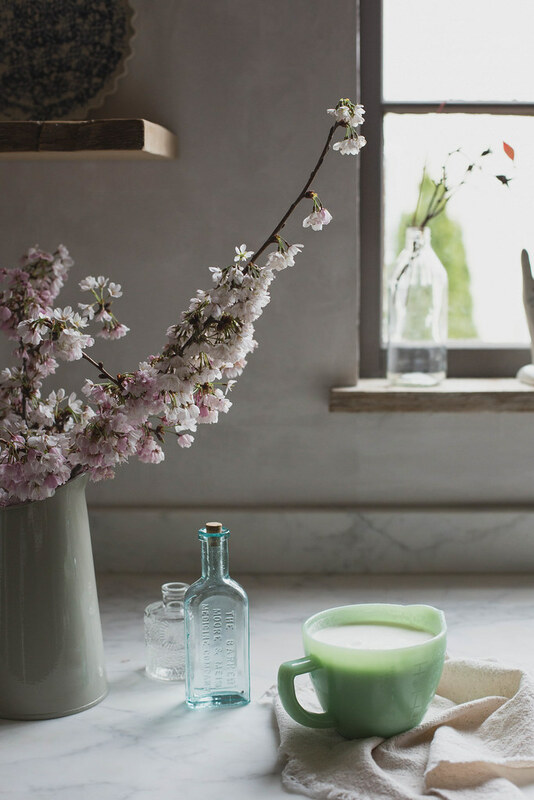 I just swooned over those cherry blossom pics- especially the one with the bottles and green measuring cup. Good grief, you take good pictures. Do you sell prints? Congrats on the nomination! Congratulations! 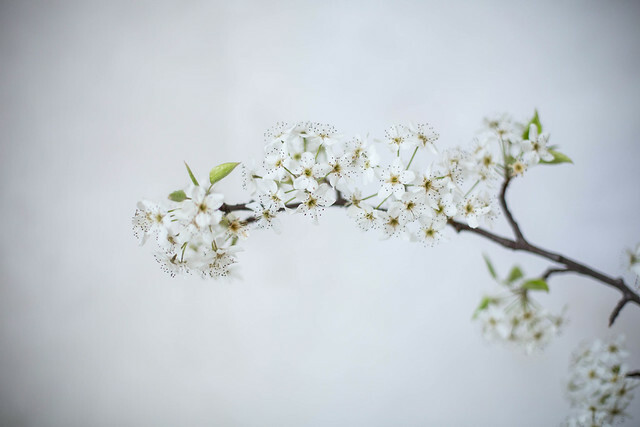 And what a beautiful dessert – I cannot wait until the cherry blossoms, apple blossoms and quince blossoms bloom here in NYC. congratulations on the nomination and being an aunt, so much to celebrate. I have never made pana cotta before but love the flavors here. 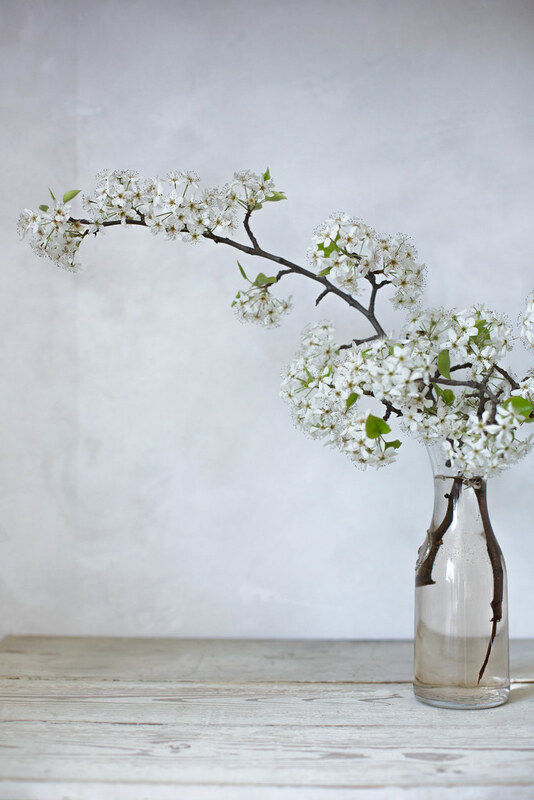 You’re inspiring me to start carrying sheers around in my pocket for to forage new blossoms. The trees here in central Virginia JUST started blooming yesterday. I’m psychically willing the cherry tree in my front yard to blossom (alas it might still be a week). But I saw a tulip poplar start to peak open this morning right down the road from my house soooooo snip snip. P.s. Are there any substitutions for gelatin in panna cotta? I know substitutions aren’t really your bag but perhaps you have a suggestion? Congrats on the nomination, absolutely love your work and your recipes! 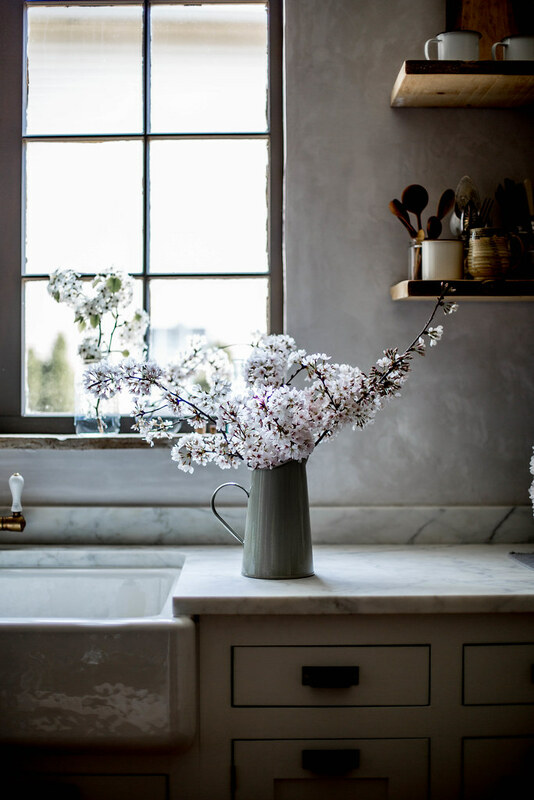 Can’t wait to see the rest of your kitchen, from the little snippets it’s looks gorgeous. You deserve the nomination so hard, friend!! BIG congrats to you. Also, this panna cotta looks crazy good! What a beautiful panna cotta, so fresh and springy! 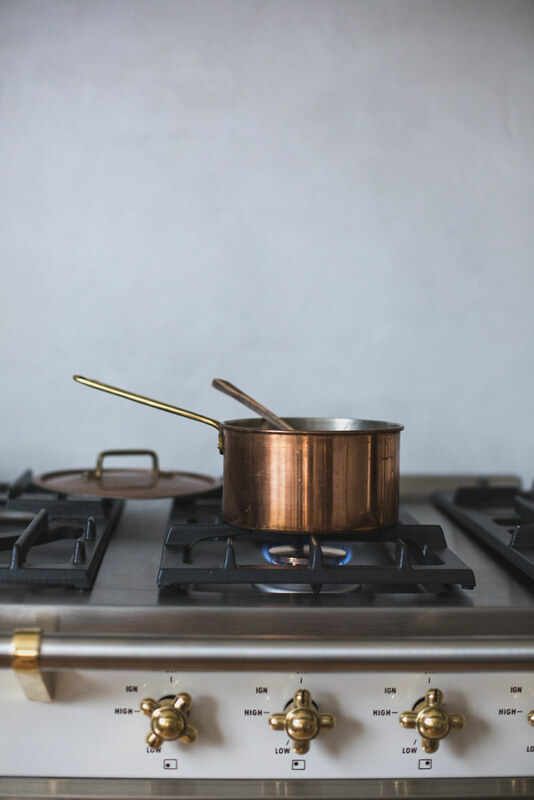 Congratulations on the nomination…no surprise here…your blog is such an inspiration from photos to creative cooking and writing. I love it all! I adore panna cotta. So simple and you can make so many flavors sing with it! I was so happy when I saw your name on Saveur. You know you have my vote already. And oh my goodness, a baby girl. Congrats. I was so excited when I was reading a Saveur newsletter yesterday and saw your blog! I voted for you yesterday! And congratulations on a niece on the way; I have a nephew and he is absolutely the love of my life. I would like to subscribe to this blog. I love it! You can subscribe in the sidebar by email or RSS….just choose which you prefer! If you have any trouble, feel free to drop me an email. 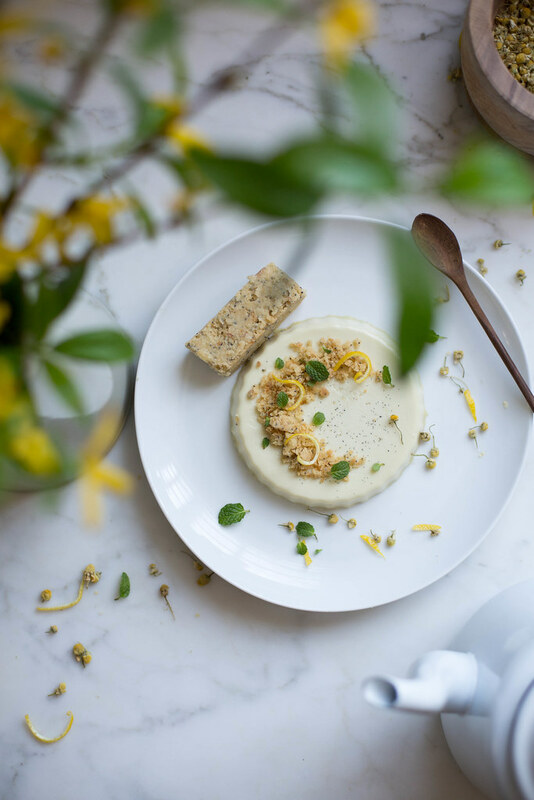 Chamomile pannacotta – sounds utterly divine. Congratulations on the Saveur nomination, most deserved. Congratulations! I found your blog a few weeks back and have been mesmerized by your gorgeous photos. So glad I found you. 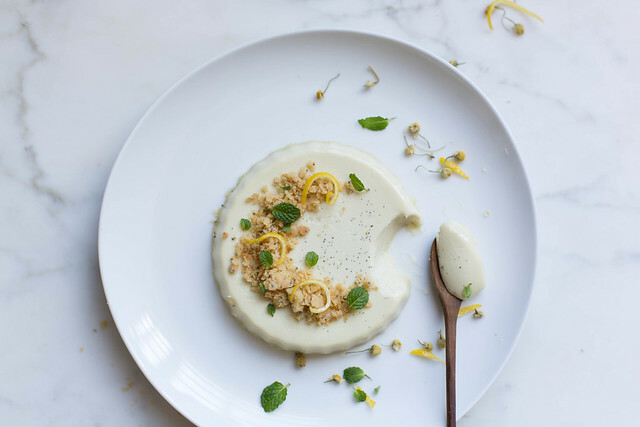 This pannacotta cotta was just the idea I needed for a dinner I’m hosting soon. I might swap some of the chamomile for meadowsweet and serve it with cloudberries (and the shortbread crumbs too, love the textural contrast!). Thank you for the recipe! Your recipes and photos are so inspiring to me. Thanks for continuing to share them with us. This looks so amazing! And … a win! Congratulations! It’s amazing how you make everything so artful. A must try! Congratulations on the bog!